Next week will be a bit diminished, due to the glories of the Fair and the duties it calls forth in the breast of every Minnesotan good and true. I had a good visit Thursday; worked the booth, which is always fun. Met readers, sold T-shirts, told lies. People come up, ask what the lip balm flavor is this year. It's French Fry, but I tell them "parsnips" or "cauliflower" and they nod: well, that's different. Then I walked around with my phone attached to a tripod, all the legs extended, holding the very bottom. I get these nice slow gliding shots, which I'll use for the bittersweet nostalgic last-day video. 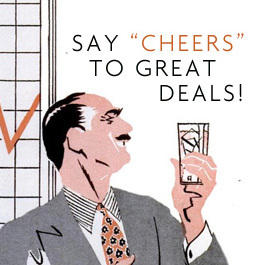 Anyway, it's Friday! And that means Pizza. 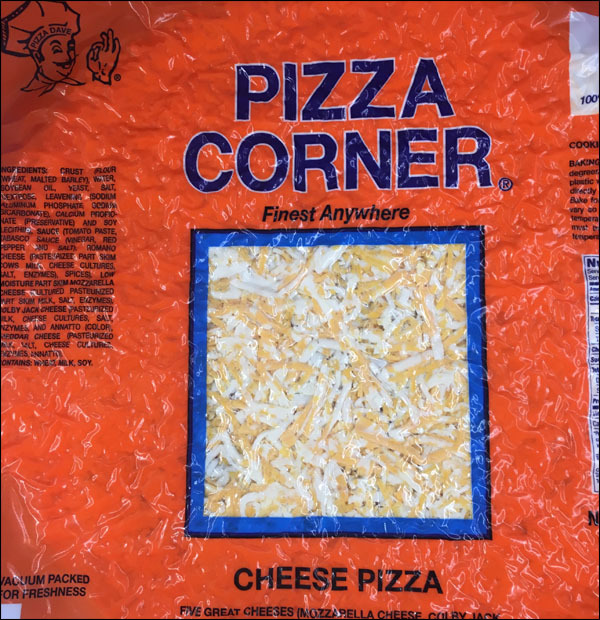 We need to talk about Pizza Corner. It's shrink-wrapped. Vacumn-sealed. It's ORANGE, the traditional time-honored color of pizza. It has a window so you can see a bit of the substance you are about to put into your body. That's an unequivocable statement. This is the best pizza on the planet. Bring it on, man - Pizza Corner will prove it's the best. Googling . . . ah. Pizza Corner started as a restaurant in 1977 in a small midwestern community on the "corner" of 2nd avenue and main street. It is from this location the name "Pizza Corner" was founded. Pizza Corner has established a niche by offering the finest pizza available on the market. You may ask why is Pizza Corner better? Pizza Corner is manufactured in a step by step process that does not allow the toppings to mix together until baking. A raised edge crust allows more toppings to be placed on top without spilling over in the oven while baking. 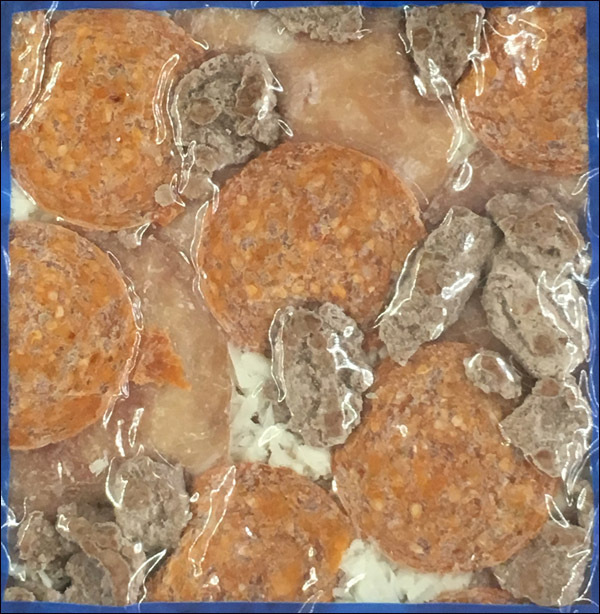 Pizza Corner is protected in the freezer case by a very thick air tight vacuum sealed vision package for sealed in flavor and added shelf life. The pizza is piled with delicious fresh toppings prepared daily. The pizza above is not exactly piled, but nevermind. Second Avenue and Main Street? WHERE? Valley City, of course. Valley City North Dakota. Where the FINEST PIZZA ANYWHERE was invented. Except there isn't any 2nd and Main. It's possible they took out the street at some point, but there's a river and park in the way. Best pizza in the state!! Try to make it there when ever I am in the area. FARGO — When Bernatello’s Pizza of Minnesota purchased iconic North Dakota brand Pizza Corner of Valley City, many die-hard fans of the popular frozen pie were worried. They believed the new owners were going to change the recipe and mess up their favorite snack. They still believe it. And now they think they have evidence. Bernatello’s, based out of Edina, Minn., says the recipe, ingredients and suppliers are largely the same with just a couple of tweaks. In fact, a company spokesperson says some of the pizzas people are complaining about are actually still being made in Valley City. The article also says that PIZZA DAVE HIMSELF is supervising the new production. His name is Dave Zubrod. An article on the sale notes that the move to Minnesota production was a blow to Valley City, since they were about to expand - but were now set to eliminate 150 positions. No small number of jobs in Valley City. When I snapped that picture at the store, surprised by the sudden appearance of orange vacuum-sealed pizza, I had no idea there was such a backstory. I am surprised that they thought they could enter the insanely competitive frozen pizza market with a product that looked so generic. 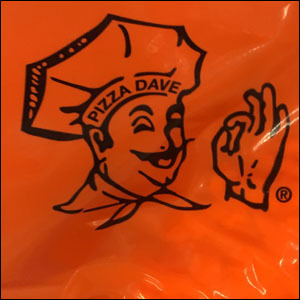 Am I willing to stake the success of Pizza Friday, the best moment of the week, on the works of Pizza Dave? Tune in Monday, and learn. It won't be this one. 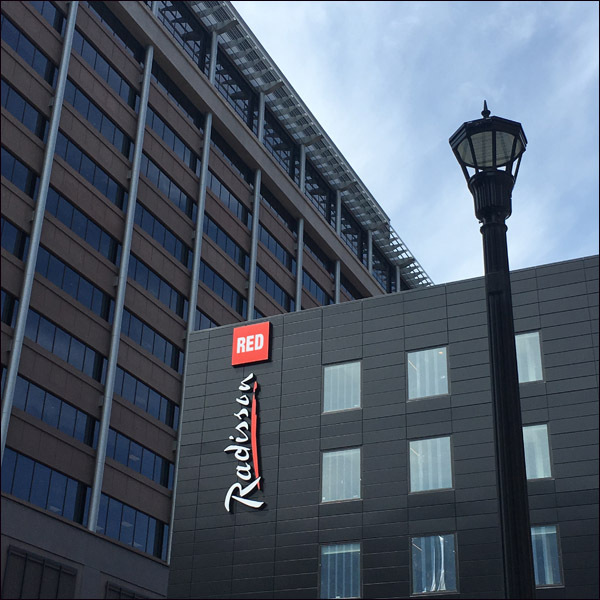 The Radisson Red, which isn't, is done. Interior work is almost finished. What was here two years ago? A parking lot. 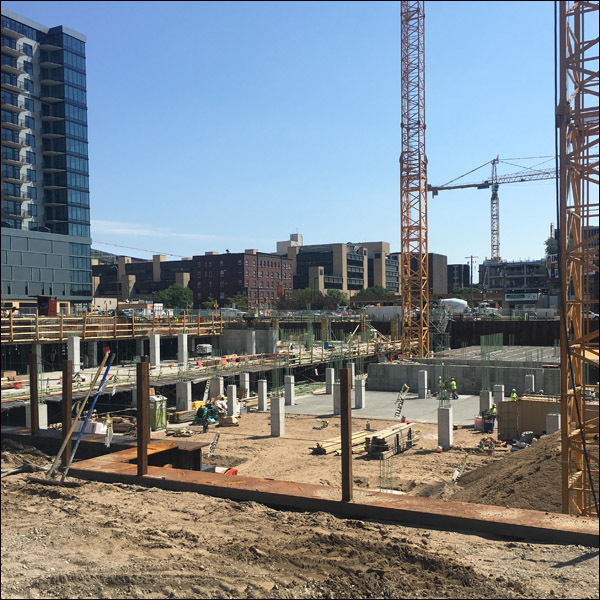 The parking ramp and foundations are down there, never to see the light of day again. The earth below was visible for about a month, for the only time in human history. Back to music cues for "The Little Things in Life," Peg Lynch's last continuously running sitcom. 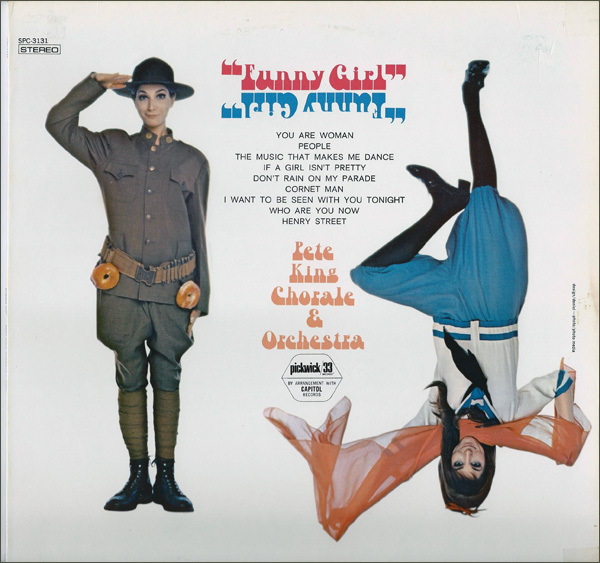 The cues run from substandard 60s cues to cringingly 70s, and I'm surprised at how few there were. I think I'm already repeating what I previously played. In fact I know I'm already repeating the fact that I think I'm repeating myself, but on we go: this is the sound of narrative radio in its strange last gasp. - but the later 60s, I'd guess. Hmm. I forgot to play this last June. I should have. Rugged men would understood. We finish our August roadside Bob & Ray feature: Grand Motel. This one's from a few years after they did the originals - those were from the CBS run, and these were from something else entirely. A speck of a place. A heck of a place. Oh, that font. Oh how I hate it. Pete King worked with Gleason, from whom he may have picked up the importance of a powerful horn. Some Aldens fashion awaits; enjoy! See you around. OH HEY watch my Fair Videos. They're short.